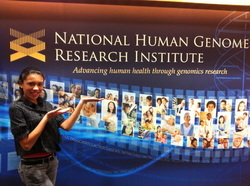 This year’s National History Day theme is “Turning Points in History.” After searching online, discussing different topics with friends, and thinking about my own experiences, I decided to focus on the Human Genome Project (HGP). My inspiration for this topic came from visiting my mom’s work. She works at the National Institutes of Health (NIH), the world’s largest biomedical research institution. When I visited the NIH campus for Take Your Child to Work Day, I got the opportunity to conduct mini-experiments in different laboratories. There have been so many scientific discoveries made at NIH, and it compelled me to learn more about how my body works. I began my research on the HGP through the library website portal, government websites, videos on YouTube, and a documentary. I also contacted the NIH to gather additional information, including a letter of support from the Director of the National Human Genome Research Institute and suggestions for people to interview. I was able to interview four people, three through email and one in person. Once I completed my research, I needed to organize it. I decided to design a website because it would allow me to arrange many complex topics into a user-friendly format. Also, I had never created a website before. I used Microsoft Word to organize my information before placing it into my website. I then inserted videos, pictures, quotes and hyperlinks. I tried to keep my design and content simple so that it wasn’t overwhelming to the reader, but was still engaging and interesting. The last thing I did was edit my website. The hardest part of editing was identifying the most important information to tell a complete story while staying within my word limit. This topic was very challenging to me because I had to sort through and understand scientific concepts and terminology, while bringing together historical timelines. Although I struggled to understand this complex topic, I learned a lot about scientific discovery. In addition, I learned how to design a website. Overall, this project has helped me improve my writing and editing skills. It has also reinforced my research skills and writing an annotated bibliography. The HGP is a great example of a turning point because it was the biggest biological accomplishment in scientific history. The sequencing of the human genome has played a major role in the way doctors treat and cure diseases. The genome is the blueprint of life. Now that scientists know the entire human genetic sequence they can begin to figure out how it works. I thought it was amazing that our DNA and genes and how they are regulated determine everything about us, from the color of our eyes to our risk of getting a disease. As with all turning points, there are positive and potentially negative outcomes for the future.